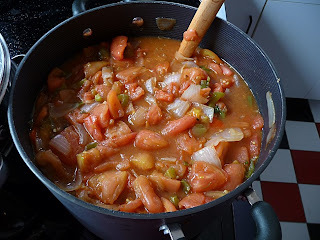 I've been making stewed tomatoes for a few years now and each time I try something just a little bit different. This year I've added just a bit of habanera peppers. We My husband uses the stewed tomatoes to cook spaghetti sauce with 1/2 of a quart of stewed tomatoes, 28 oz can of store bought tomato sauce (to thicken it a bit) and a pound of ground beef. He also makes goulash which is pretty much the same thing minus the tomato sauce and he uses shells instead of noodles. Below is my one batch recipe that will make about 7 1/2 quarts; obviously you can adjust everything but the lemon juice. I cut the ingredients chunky. 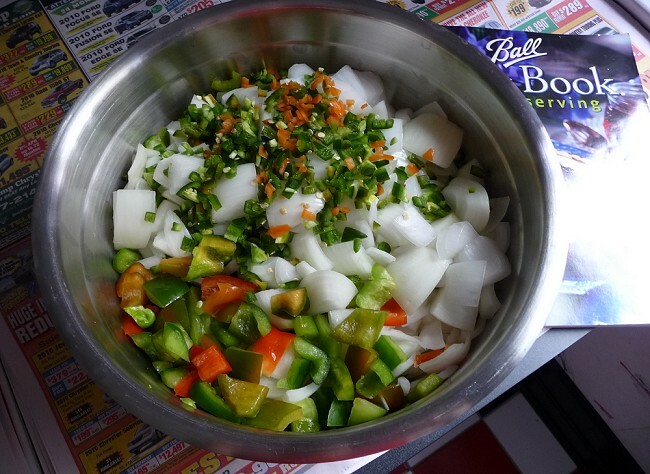 1 tomato is cut into 8ths, green/red peppers and onions are cut about 1/2" pieces. The hot peppers and garlic should all be cut up small. 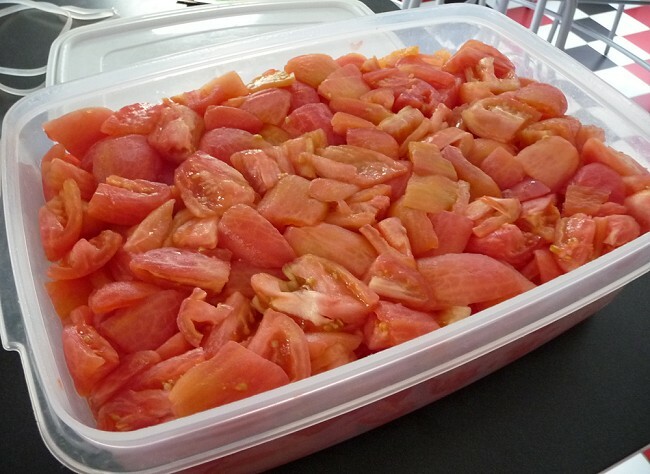 If you don't want to do this all in one day it is perfectly fine to prep the tomatoes and let them sit in the fridge overnight; pour out the liquid that accumulates in the bottom of the container a couple of times. If you really want to get rid of the liquid remove the seeds and membrane from the center of the tomato. 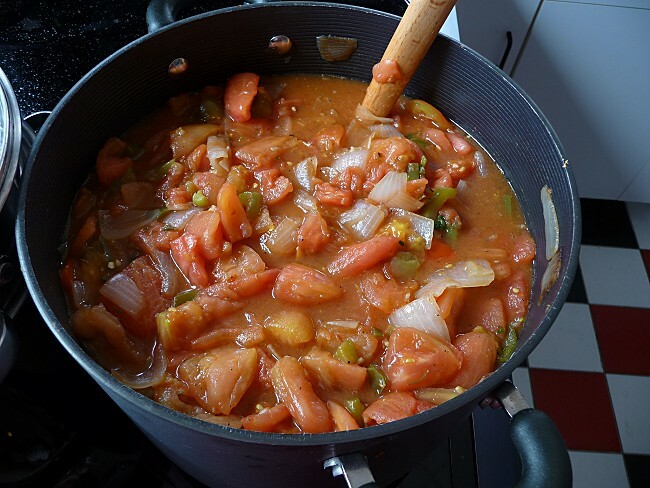 Begin by blanching the tomatoes for 45 seconds and dunking into cold water. Remove the tomato skin and squish out some liquid (If you store them overnight you can just pour off the liquid a few times - I poured off probably 3-3½ cups of liquid) Halve the toms, cut out the core then quarter the halves (8 pieces). Prep about ¾ of the tomatoes and start the canner leaving the last ¼ of tomatoes to do in a bit. 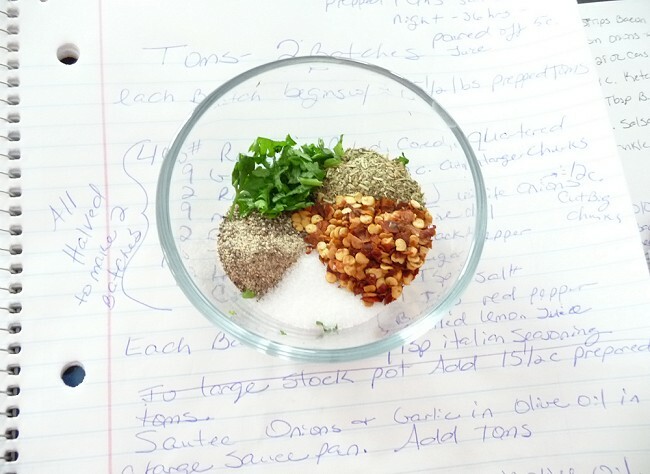 Cut up the other ingredients. Put everything but the tomatoes into a large pot (12 quart or larger is best) and sauté with about ¼ cup olive oil. Stir Frequently. Sauté for about 20 minutes. Add the prepared toms to the pot of sautéed ingredients and cook for 20 minutes. Prep the jars and lids following standard canning instructions. Have rims, jar lifter, lid lifter, wet towel, hot pads and newspaper ready. Add 2 Tablespoons of lemon juice to each quart size jar. 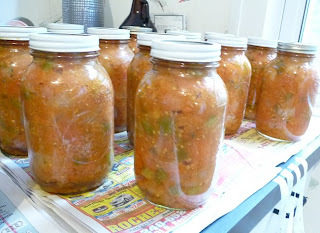 Place lid and rim on the jar and process the jars in the water canner for 40 minutes. Remove from the canner and place on many layers of newpaper to protect your counter. After 24 hours, remove the rims (wash and store them), wipe down the jars and when dry you can apply a label. I prefer my labels to be on the glass so I use a piece of masking tape and label it (Stewed Toms - 8/8/10 - Batch #1). It is recommended that you store your toms in a cool, dry place for up to a year. I store mine in the basement and have had no problem with jars that are two years old.